Add consomme, soup, beer, kitchen bouquet, garlic and onion powders, pepper and sliced mushrooms. Cook on high for 7 hours. Take meat out an hour or so before serving and slice against the grain. Put meat back into the slow cooker to absorb the juices. Open rolls up on baking sheet and spread with butter or top with grated cheese. Bake for 10 minutes or until heated and crunchy on the outside. Fill heated rolls with meat. Dish sauce into individual bowls. Dip sandwiches into jus and enjoy! I'm sort of a health nut now, so french bread and beef are not my normal fare. But this recipe is just SO GOOD! 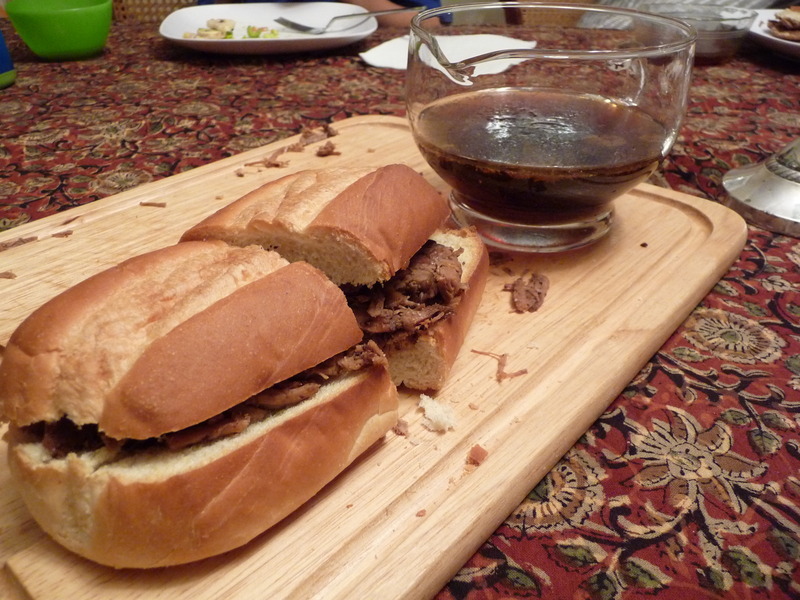 I haven't had a French Dip in years, and this is the best I can remember. Give it a try when you feel like transgressing. Everyone in our family loved it...even the baby! Kids loved it and very easy to make...never really used crockpot before but this dish opened a whole new world! My family and I have been searching for a recipe for french dips, and it looks like our search is over. This is great and it made for a great 4th of July meal. I made some simple modifications, my husband is allergic to beer so I omitted that, and it still turned out wonderful. Very tasty! I did not add mushrooms but still tasted great! The only problem I had was slicing the meat. It was so tender that it just fell apart and I wasn't able to slice it thin. This was soooo tasty and the meat was oh so tender! My kids loved it too and I look forward to making it again! This looks very good. I may try this one day myself. 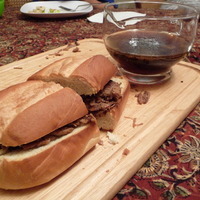 I have made french dip sandwiches in the crockpot before and they are a family favorite. The addition of beer and mushrooms in your recipe is quite interesting. Might have to try it this way next time I make it. ...adding slow cooker to my wish list, right under "bigger kitchen"
Just noticed your question. My slow cooker (crock pot) has a low and a high setting and I usually use it on high until the meat is tender and turn it down if need be. This is a great recipe so I hope you'll try it! Hi Jason, Just noticed your question. My slow cooker (crock pot) has a low and a high setting and I usually use it on high until the meat is tender and turn it down if need be. This is a great recipe so I hope you'll try it! What does "cook on high" mean? Does the meat go in a dutch oven on the stove and boil on high for 7 hours?